VELLUM - WINNER AT WORLD WINE AWARDS!!!! The VELLUM Wine Club is now open for membership! As a club member you will receive convenient deliveries of VELLUM directly to your door – at a great discount! As a member of the Vellum Club Level you will receive a selection of current release and new release wines in multiple format sizes including regular, magnum and half bottles. As a member of the Vellum Collector's Series, you will receive a selection of our current release wines, magnums and exclusive early access to new releases. As many of you know, we produce a limited amount of VELLUM each vintage - which means that we can only offer membership to the VELLUM Wine Club to a few hundred households before we sell out. 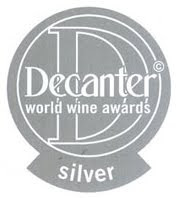 We are proud to announce that the 2007 VELLUM Cabernet Sauvignon is the WINNER of the 2010 World Wine Awards, Silver Medal (presented by Decanter Magazine). Over 10,000 entries competed from all over the world. A panel of esteemed Masters of Wine, Sommeliers, and wine professionals chose VELLUM from among the participants to receive this prestigious award. I spent yesterday afternoon and evening among the vines in our Petit Verdot vineyard high in the hills on the east side of Napa Valley. The vines are growing very rapidly right now - and the grapes can be seen in their smallest state - no bigger than 2 or 3 millimeters in size. They are clustered in bunches below the large mature leaves. There are also dozens of new tiny leaves on each vine, unfolding as the vines push toward the sky. Today the vines are being tucked between the trellis wires to keep the vines reaching ever higher without bending to the ground under their own weight. Petit Verdot loves sunlight and higher temperatures...and this eastern-facing hillside vineyard is the perfect spot for this stunningly beautiful vineyard. The warm afternoon winds sweep across the vines during the ripening period and do a great job of keeping the fruit dry and healthy. The dryer the air is, the more moisture is lost through evaporation. This helps to create great concentration of flavor and richness in the grapes. As we get closer to harvest, we will see the grapes grow from their tiny bead-like state...into large green berries. In August, they will start to turn black and ripen with sugar. Keep checking back with us (and follow VELLUM on Facebook.com/vellum) to hear the latest updates on the 2010 VELLUM vintage.